35 year old Andy Munroe has featured for the Great Britain under 20s, in the BNL, EPL and NIHL across a senior hockey career that has spanned almost two decades. After lining up in Hull in the now defunct British National League (BNL) from 2000, Munroe joined the Peterborough Phantoms in the newly formed EPL in 2004 and here he stayed for 5 years racking up 202 league appearances. The ‘stay at home’ defenceman chipped in with 8 goals and 36 assists and was part of the Peterborough team that claimed the league title, lifted the cup and then marched on to playoff glory in the 2008/09 campaign. In 2009/10 Andy Munroe moved further south as he split his season between the Romford Raiders and Slough Jets, both of the EPL. Across the year he iced in 54 league encounters and again enjoyed success with a playoff win at the close of the campaign. 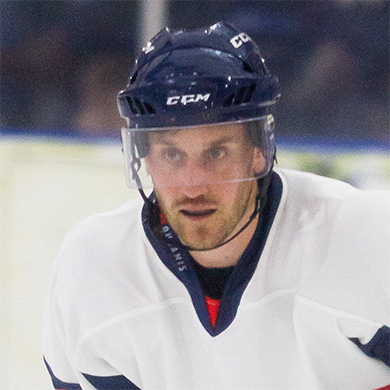 He would make another 54 outings for the Jets in 2010/11 and scooped yet another winner’s medal as Slough romped to cup success – the second of Munroe’s career. The Bracknell Bees came calling for Andrew Munroe in 2011 and he remained with the Berkshire outfit for two terms chalking up another 107 EPL appearances and 17 points. In 2013 the blue liner then returned north to feature for the Billingham Stars in the NIHL and he stayed in the north east for three campaigns, wearing the ‘A’ of Alternate Captain for two. Munroe made 79 league appearances for the Stars and notched another 8 goals and 23 assists in his time at the Forum Ice Arena before briefly halting his hockey career as he relocated. He missed just half a season and was back in action come January 2017 – this time occupying the blue line for the London Raiders. Having iced for the Raiders 11 times in the run-in of 2016/17, he stayed for a further term in 2017/18 and played another 27 games – grabbing 5 assists in the process. Now Munroe will make the Dynamos his new home as he pens a deal bringing him to Planet Ice Gillingham for the 2018/19 season.